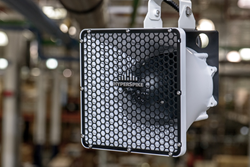 HyperSpike® TCPA-10 Directional Speaker Arrays have acquired UL1480 listing and Class 1, Division 2 Groups A, B, C, and D Hazardous Location Certification. Ultra Electronics USSI announces today that its HyperSpike® TCPA-10 Directional Speaker Arrays have acquired UL1480 listing and Class 1, Division 2 Groups A, B, C, and D Hazardous Location Certification. This new certification not only fulfills the NFPA 72 recommendation for use with fire panels, but also provides safety compliant mass notification solutions into oil, gas, petrochemical and other hazardous locations. The TCPA-10 is a highly efficient indoor and outdoor directional speaker for general public notification and emergency signalling. Utilizing patented HyperSpike® technology, this speaker projects clear, intelligible voice commands, and penetrating alert tones with a maximum output of 139dB. Available in distributed audio, 4 and 8 ohm configurations, the TCPA-10 can be directly powered from a fire alarm control panel or through commercially-available amplification systems. HyperSpike® best-in-class acoustic coverage allows for fewer units to be installed in large indoor and outdoor facilities; lowering installation and long-term life cycle maintenance costs. Typical indoor and outdoor applications of the HyperSpike® TCPA-10 speaker include: hazardous environments, campus communications, manufacturing facilities, fire and life safety, warehouses, corporate grounds, airports and airport hangars, arenas and stadiums, parking structures and many more. Ultra Electronics is an internationally successful defense, security, transport and energy company with a long track record of development and growth. The Group manages a portfolio of specialist capabilities generating innovative solutions to customer needs. Ultra applies electronic and software technologies in demanding and critical environments ranging from military applications, through safety-critical devices in aircraft, to nuclear controls and sensor measurement. These capabilities have seen the Group’s highly-differentiated products contributing to a large number of platforms and programs. Ultra has world-leading positions in many of its specialist capabilities and, as an independent, non-threatening partner, is able to support all of the main prime contractors in its sectors. As a result of such positioning, Ultra’s systems, equipment or services are often mission or safety-critical to the successful operation of the platform to which they contribute. In turn, this mission-criticality secures Ultra’s positions for the long-term which underpins the superior financial performance of the Group. Ultra offers support to its customers through the design, delivery and support phases of a program. Ultra businesses have a high degree of operational autonomy where the local management teams are empowered to devise and implement competitive strategies that reflect their expertise in their specific niches. The Group has a small head office and executive team that provide to the individual businesses the same agile, responsive support that they provide to customers, as well as formulating Ultra’s overarching, corporate strategy.